Let's talk a little about the university and how a philosopher looks at the goals of the university, but also the changes that have occurred at Berkeley. This was your first position here, and shortly after you came, the Free Speech Movement started. And you were involved in that. Tell us about that. Well, okay I will. That was a long story and what happened was this. I am not basically a very political person. Given a choice between intellectual life and political life, I'd take intellectual life any time. It's more fun. In the long run it's more satisfying. But when I came back from England I was involved in civil liberties activities, and in particular I was involved against the McCarthyite residues of the fifties. I was involved against something called the House Un-American Activities Committee. And I had, as an undergraduate at Wisconsin, been active against Senator McCarthy, who was then our senator in Wisconsin. I was secretary of an organization called Students Against McCarthy. So I kept that as a kind of sideline. And to my total amazement, I was forbidden to speak at our law school in response to a movie put out by the House Un-American Activities Committee. The Chancellor's Office called up the law school and said, "That guy Searle is too controversial, you can't have him speaking." This was a man named Vice Chancellor Kragen under Chancellor Strong, who called up and forbade me to speak at the law school and invoked various stupid university rules, the "Kerr Rules," he called them. Now, Clark Kerr assures me this was a misapplication of the rules, but at the time they could shut off my free speech and I can tell you, I did not appreciate that. I was extremely indignant that that had happened to me. I was an assistant professor in this university, I was invited to lecture in a law school class, and a Vice Chancellor Kragen in the Chancellor's Office could call up and stop that lecture. So a couple of years after this incident a bunch of students came to me and said, "We are protesting the absence of free speech on the campus. We've got something called the Free Speech Movement." And they found in me a sympathetic audience. I was extremely sympathetic to the idea that the university had a long way to go to assure complete freedom of speech. And in particular I had a good student named Mario Savio, and I had a teaching assistant named Suzanne Goldberg, and they were the first people that I talked to about this student activity that was going on. I remember one day going around with Suzanne and seeing all these people surrounding a police car and seeing the most amazing scene. I mean, it wasn't like something out of the 1950s. So the first thing you know, I was busy making speeches on behalf of the FSM. I became very active, in fact I was the first tenured faculty member who really took the side of the students and I was extremely active on the side of the FSM. And what did you learn from that experience? Obviously the Free Speech Movement became something entirely different over time. Yes, it did. Yes. Well, there are a number of things that happened, most of which would have been unpredictable. 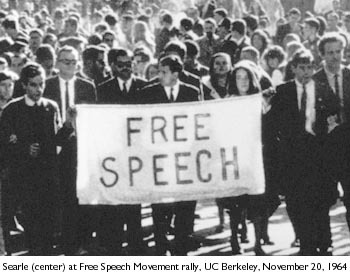 The Free Speech Movement, within its own initial objectives, was successful. We did change the university regulations so the kind of thing that was done to me as an assistant professor couldn't be done after 1964, and I don't believe it could be done today. I may be wrong about that but I don't think so. However, two other things happened that really we couldn't have predicted and they were not so fortunate. One is, we created a whole lot of radical expectations. This is characteristic of revolutionary movements; people involved get a sense of enormous possibility. "All kinds of exciting things are going to happen, we can create a new kind of a university. We can create a new kind of a society. It's all going to start right here in Berkeley." That's one thing that happened: we created unreasonable expectations about what could be achieved by a student movement of this sort. And a lot of people wanted to keep going after the FSM because we had this marvelous student movement here, we've got all this energy and idealism. It's very hard after you've had the heady and exhilarating triumph of overthrowing the university administration to then go back to your classes and start doing homework, taking notes, and writing term papers. A lot of people found that very hard. The second thing that happened was an issue came up that really made it impossible to carry on a normal civil life in the United States, and that was the Vietnam War. By the late sixties, from '66 afterwards, it became progressively more difficult to run the university in the face of the amount of protest that went on against the Vietnam War. So the FSM, by providing an example of successful student protest, created imitators all over the United States, and it was possible for a lot of people to have the illusion that, well, we have created a national student movement, and this national student movement is going to have an enormous change, an enormous effect on the process of change in American life, beginning with the Vietnam War. I mentioned two things; actually there was a third thing that happened, and that is the set of totally dreadful vulgarizations of culture that occurred under the general name of "the sixties." In the sixties, people had a whole lot of really quite stupid theories about life. They thought, you get immediate gratification through drugs, and indeed if you can't get immediate gratification through drugs then you get it through some other equally instantaneous form of gratification. The idea that satisfactions in life normally take a lot of work, you have to do years of preparation to do anything worthwhile, in the sixties it was very hard to convince people of that. In your book Campus Wars you look at some of the underlying structural conditions that, so to speak, weakened the immune system, made it vulnerable to these issues like Vietnam. And you talk about the real generational difference, that these expectations were based in a society where many of the students had come from privilege, unlike your generation. Yes. They were not Depression babies. I mean, I don't want to oversimplify this, but there was a psychological difference in the attitude of the students in the sixties and the attitude of students in the fifties. Students in the fifties had been brought up in the Depression and had lived through the war. And they understood what it was to be economically insecure. They understood what it was for the country to be threatened. But the students who arrived here in the sixties had grown up in an unparalleled period of prosperity and security in American life. They were afraid about atomic war, but nobody really thought that the United States was a weak country or that we were economically desperate, whereas they did think that in the 1930s, we were quite desperate economically. So I don't want to, again, oversimplify this, but moral outrage is essentially a middle-class luxury. You have to feel pretty secure in your own personal status and existence in order that you can become morally outraged at injustices done to other people. That was possible in the sixties in a way that it wasn't possible in the fifties. And you, in your analysis of that period, you do believe that in many ways the major institutions, especially in the university, were unresponsive. Yes, well, for a number of reasons. In part because they'd never seen anything like this. They were themselves creatures of the twenties, thirties, forties and fifties, and there hadn't been anything like the student protest movement of the sixties. Now you might say, well what about the thirties? Didn't you have a lot of student activism in the thirties? There was a fundamental difference between the student protests of the sixties and earlier generations. And that you can state in one sentence. The student protesters of the sixties identified the university itself, as an institution, with the forces of evil that they thought of themselves as fighting against. So in the thirties, students who were militating against fascism or trying to overthrow capitalism didn't think of the university as their enemy. But in the sixties, people who thought we are fighting for the liberation of the blacks, or we are fighting against the war in Vietnam saw the university as the enemy. And the university was a much more vulnerable target than, let's say, the Pentagon. So whereas in a traditional student movement if you had a national issue like foreign policy or the economic system, you didn't think of the university as the institution you should attack. And in the sixties it was the institution that was attacked. I have another question for you. I have often heard that the first tier of leaders in the Free Speech Movement was qualitatively better than the later tiers. Do you agree with that, since you mentioned that two of them were your students? Well, I don't want to oversimplify it. What happened was this. The FSM became vulgarized, and that was bound to happen. Not all of the leaders of the FSM were first-rate intellectuals, but some of them were. Mario definitely was. Mario was a very good student by anybody's criteria, and I think it's, in a way, sad that he didn't have a normal intellectual career because he certainly was capable of it. But there were a lot of people involved in the FSM, even in the early days, who I thought were opportunists, who were there as a way of seeking power or overcoming personal problems. What happened after the FSM, though, was not that there was a general decline in the IQ, but somehow or another this became, so to speak, an undergraduate career option. That is, it became something you could "do" as a student. And the role models had already been created, so all kinds of people who really hadn't paid their dues fighting southern sheriffs and so on, as the original leaders of the FSM had, could then become prominent student radical leaders. Many of them weren't students of course, they were just people who came to Berkeley like Jerry Rubin. Jerry Rubin did not come here as a student, he came here after the FSM to try to get in on the activities. But there was a kind of opportunism and a sort of, I don't want to use the word careerism exactly, because it's not a normal career, but a model of opportunity was created by the FSM that didn't exist before and it attracted all sorts of mediocre people. How do these events change the university and our understanding of what a good education is about? And how much they're making. And how much they're making, for better or worse -- but he would not be astounded by the system of courses, credits, lectures, exams, degrees, and so on. All of the basic apparatus remained unchanged. However, there were forces at work in the larger society that combined with the radicalism of the sixties, that, I think, made serious long-term damage to the university. And what was that damage? Well, again, it's very hard to summarize but I would say the university became less self-confident in its elitism. By definition a university has to strive for the best. If you're not striving for the best you're not the best university, you're not doing all that you can. But the best means that some things are better than others. Some professors are better than other professors, some books are better than other books. Some ideas are intelligent, other ideas are stupid. And a university has to be committed to quality. It's nothing mysterious, it's like the San Francisco '49ers. They try to get the best coaches and the best players and make them do the best they can. Well we're supposedly trying to get the very best professors and the very best students, and that means intellectually the best -- the intellectual elite of the country as the professors, and the intellectual elite of the state and people from out of state as the students -- and make them perform at the highest possible level. Well, we're still committed to that but we're more bashful about saying it in public. And there is a sort of an undercurrent that, well, maybe that's all a really kind of disguised power structure and maybe it's all a sort of disguised oppression and colonialism, and we've got to get out of this idea that some books are really superior to others, and some students are superior to others, and some professors are better than others. And that's bad. I mean, if you don't believe in quality, and you don't believe that the ultimate criterion of success in this game is what's better and what's worse, what has the quality and what lacks the quality, then you've given up on the ideal of academic life. And I don't want to overstate this. I don't want to say we've abandoned our elitism. But we're less self-confident than we were in the fifties and in the sixties. You've written that "Traditionally, one of the aims of humanistic education was to get the student to overcome the accidents of his or her background. You are invited to redefine yourself as an individual in light of a universal human civilization and cultural tradition." And then you go on to say, "Emphasis was on the individual within the universal. Now you derive your identity not from individual efforts at self-definition, but rather from the group to which you belong." Yes, well now this is a particular manifestation of what I was talking about, and I think, in a way, it's the worst single manifestation of this. We have abandoned the idea that the university invites the student to become part of a universal community of scholars, part of a universal community of human civilization, where you achieve individual self-definition through participating in a universal human civilization. Now what we tell you is, what's your ethnicity? What's your race? What's your gender? That's who you are. You don't define yourself. You are defined by race, gender, class, ethnicity, and cultural background. And that isn't just stupid, that's evil. I'm fighting against that, but I think a lot of people now accept that. They think that's perfectly legitimate. And one way to put it is to say that traditionally in America, such things at that were regarded as accidental. It's like you're blue-eyed or you're left-handed. You don't build your life around being left-handed, and you don't build your life around your ethnicity or your race. These are just stupid accidents of your birth. The serious professional intellectual regards it as an accidental fact that he or she was born of a particular race or a particular gender. You create yourself as an individual intellect and that's what counts, and we will invite you into membership into a universal human community of advanced culture. And within that community you can create yourself as a serious individual. But now we're telling otherwise innocent children, "Look, you came from this background, that's who you really are." And I think to say that is to abandon one of the fundamental advantages of the university education, namely, before we told you, yes, okay, you came from this background, you can be proud of this background, we'll offer you something better. We'll let you redefine yourself, giving you the resources of the whole of human history to redefine yourself. Now we've even got this stupid Ethnic Studies requirement where we make people study American cultures where the idea is you're supposed to celebrate various forms of really quite ordinary phenomena. There's nothing intellectually special about having been born a certain race or a certain gender. Now, given your background -- you said your mother was a doctor and so you were used to a liberal environment that might have not been traditional -- you would agree though that the canon needed to be expanded to a certain extent. But the problem became something else, is that what you are saying? Exactly. I never quite believed that there was a thing called "the canon." There were something called "the classics," and the idea was that there were a collection of works of human civilization that, because of their intellectual quality or their historical importance, or both their intellectual quality and importance, were regarded as an essential part of education. So Plato is both important historically and has high intellectual quality. Marx is certainly important historically; you can have debates about the intellectual quality of the work. But both of those are important for people to read. The idea is that we are conveying to you a human civilization with a number of cultural and intellectual achievements of quality and importance. And now that's challenged. Now the idea is, oh well, one book is as good as another. I debated a guy once at another university who said, "Well, you know, Bugs Bunny is as good as Shakespeare. I mean these are all just texts. One text is as much of a text as another text." And indeed one English department at one university said, "We really shouldn't call ourselves the Department of English Language and Literature, we should be called the Department of Textual Studies." And from the point of view of textual studies, well, a cereal box is as good as a sonnet by Shakespeare. It's all just some nonsense. You can always say in French, "C'est la textualité du texte." A certain kind of textuality is all that counts. So that, I think, is ... that isn't just stupid, it's self-destructive. Because if you don't believe that there's a distinction in quality then why on earth would the taxpayers pay you, why would the students pay you to teach this stuff, if one opinion is as good as another and one text is as good as another? That is, I think that the mission that we're engaged in is predicated on a belief in quality. And teaching students how to think. Well absolutely. But there are different ways of thinking. You can't just teach a student how to think like that. You've got to teach them how to think in a sensitive and critical fashion about interpreting poetry. You've got to teach him how to think rigorously in analyzing philosophical arguments. You've got to teach him to think in the lab about how to conduct a lab experiment. So the idea that's ... you see, if you just say, well, our method is teaching people how to think, then it seems like these courses that consist of just bull sessions are as good as anything else. People sit around and talk about their upbringing and how they felt oppressed, and what their community was like and so on. That is not, in my opinion, a serious form of intellectually rigorous thinking. That's sort of self-congratulatory introspection. And part of education is getting beyond that. Exactly. Part of education the way I teach it is [that] I teach the students to overcome the accidents of their background, to think about things they would never have thought about otherwise. In high school nobody teaches you about -- unless it's a most remarkable high school -- various neurobiological approaches to solving the problem of consciousness. I mean that's something you have to get to an advanced level in order to be enabled to reflect on.